Weipa is a Rio Tinto company town of 3500 souls (a third of them children!) 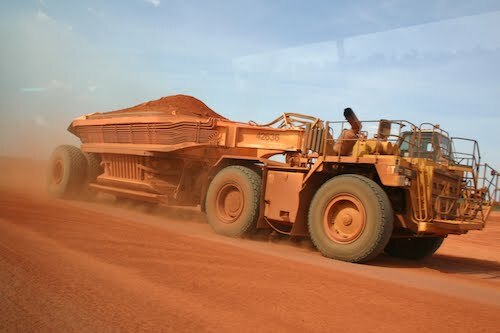 that exists to service the largest bauxite mine in the world. Many of those bulk carriers that we encountered in our journey up the reef were carrying bauxite ore to the smelters that we visited in Gladstone, so we were interested to see this end of the process as well. From the chart we could see that there are two rivers that flow past Weipa, Mission to the north and Embley to the south. The Embley River is the shipping channel and well provided with navigation markers. The Mission River is much, much closer to town but has no markers and nobody in the literature seems to mention it as a potential anchorage. We went with the herd and put our anchor down in Embley across from the ore loader, in a large natural harbour ringed with beaches and mangroves. We could see some houseboat moorings against the north shore, and there seemed to be a couple of other yachts anchored over there, but they were close to the ore loaders and we decided instead to shelter under the lee of the southern shore. The anchorage was calm, comfortable and quiet, except at the bottom of the tide when there was a 4.5 knot rip but it only rocked the boat for an hour or so in the morning. Occasionally a Panamax-class bulk carrier came by, but the harbour is big enough that we didn’t really notice, except when they eclipsed the sun. The only way to shore is by Evans Landing, a public jetty that gives access to Steve the houseboat guy’s premises and little else apart from a telephone box, which you will need because the only realistic way into town from there is to call a taxi. Evans Landing was a mile away across the bay from our anchorage, but not a problem for our little 3 horsepower dinghy as long as we avoided low tide. AN ANCHORAGE FAR, FAR AWAY. CAN YOU SEE OUR MAST? Naturally the first thing that we did when we got to shore was to hunt down the pub, in which we were stymied because there is no pub, or indeed any real town centre. Since Weipa was originally just housing for the mine, it hasn’t grown up around a traditional centre, and has more the feel of a bunch of haphazard suburbs. There are, however, two clubs. Several people told us that the reason that Weipa has a Golf Club and a Lawn Bowls Club is because these are the two sports that you can perform while drinking. We randomly chose the Bowls Club, and had a great time and met (and drank with) a large number of interesting and colourful characters. We also managed to eat some local prawns. This may not sound much of a feat, but all the way up the Queensland coast we have been trying to eat local seafood, only to find that all their catch is frozen and sent to the city. When the local restaurants need fish, they have to import it frozen from the usual sources. The Weipa Bowls Club had Banana Prawns straight from the Gulf of Carpentaria. They were excellent. Tomorrow we’re heading out on an extended passage across the sea to Gove. Since the Bureau of Meteorology clearly has no idea about the weather in the Gulf, we haven’t read the weather but we have downloaded some GRIB files which tell us that we will have decent winds during the day but nothing but motoring at night. This entry was posted in Australia, Oceania, Travel, Voyage of Pindimara and tagged Gulf of Carpentaria, Sail on 2009/09/01 by Reinhard. 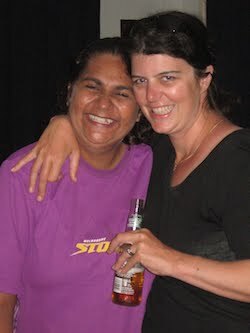 It was a shame you did not visit the Weipa I know and love. Yes there is a pub, the Albatross. Close to 80% of residential houseing is privatly owned. Once we were a mining town but that has long passed. Shame you did not make it past the Clubs to the town centre, not all visitors view us through the bottom of a stubby. Hmmm… if you know the landlord of the Albatross, might be an idea to get him to put a sign up at Evans Landing, because the taxi driver didn’t know that Weipa had a pub, and neither did any of the locals fishing on the jetty.